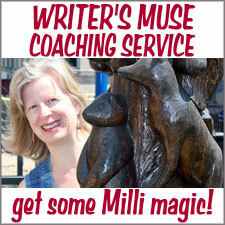 In my first article in this series I told you about our drive around the west coast of Maui—on a road not even marked on some maps—to Kahului, and back around to Kaanapali where we were staying. 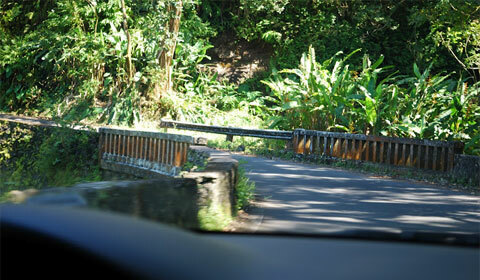 The next tour we took was the Road to Hana. Considering the drive we took a few days earlier, this one didn’t seem so bad. 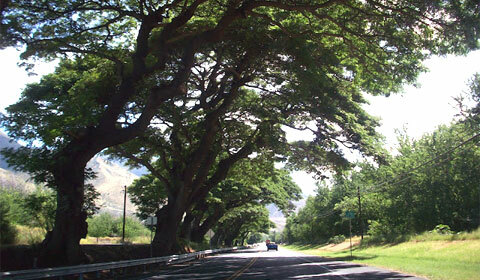 The Hana Highway is well known for its hairpin turns, skinny roadways, and one-lane bridges. 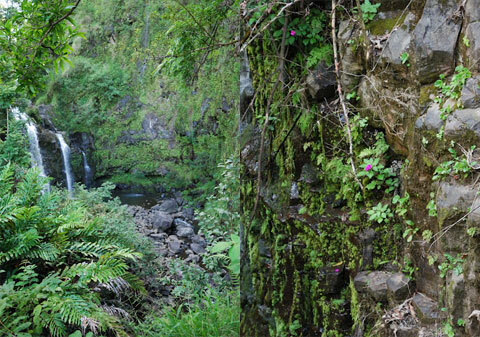 It is normally quite busy with tourists who want to experience the wonders to be seen and to say they “survived” the Hana Highway. We were lucky as it didn’t seem to be that busy to us that day. One of the things I liked when starting these drives is that it wasn’t far from city crowds to quiet lanes lined with pineapple fields and beautiful gnarled trees, their branches hanging across the road and dappling the sunshine. 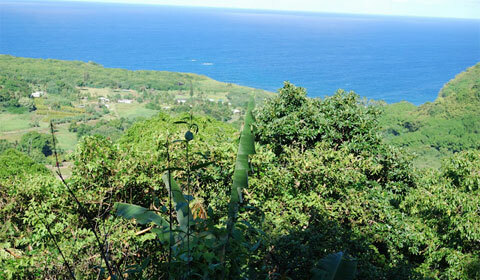 Like the Honoapiilani Highway it also had jaw-dropping scenery, with many beautiful waterfalls and ocean vistas. tame here. I've seen pictures of them when they look like one big fall. 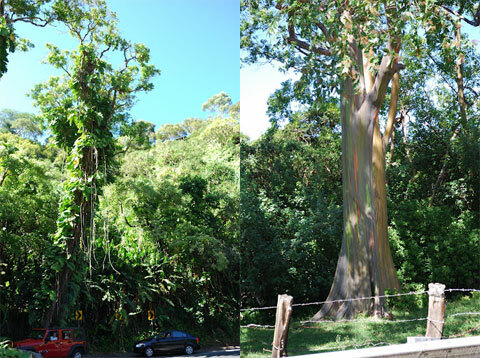 Among some of the wonders we saw along the way was the “rainbow tree.” It’s a kind of eucalyptus, and it sheds parts of its bark at different times every year: showing a bright green inner bark that darkens as it gets older to blue, purple, orange and then maroon. As we got closer to Hana and the east coast, we could feel the moistness in the air and see differences in the trees and plant life. The smells of flowers and rotting fruit (a smell not really as unpleasant as it sounds) that have fallen from the trees got stronger. 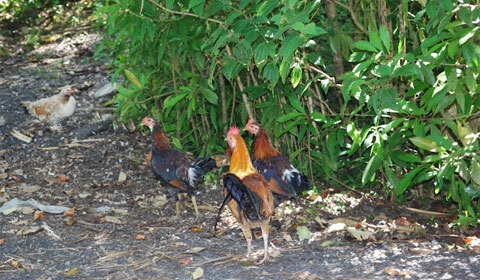 Along with unbelievable ocean vistas and cooling waterfalls, we saw many chickens along the side of the roads. They are everywhere! Chickens were introduced by European and Asian visitors. Wild chickens are called “moa” by native Hawaiians. Chickens are wild on Maui. They're everywhere! We were staying in Hana so we didn’t need to worry about the drive back that day. We took our time and let the afternoon drift away as we made our way up the side of ocean cliffs, around emerald bends and down into the beautiful village of Hana. 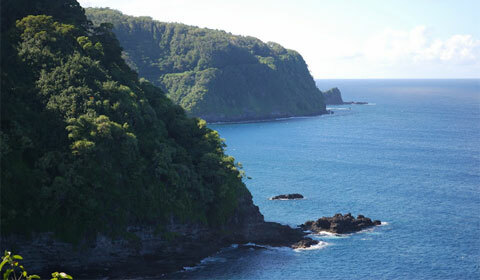 From the green jungles of Hana, over empty arid mountainsides, to the top of Haleakala! Coming up next in Part 3 of my driving tour, where I’ll bid a fond farewell to Maui—an island that will be forever in my heart. Great story! It makes me want to go!! Maybe some day you will. If you ever get a chance go for it. You will be glad you did. What a beautiful drive! I just love it! …the rainbow tree is incredible! Yes, it was like every turn we took there was another beautiful sight. When I saw that rainbow tree I wanted one for my yard…too bad they don’t grow around me. It was so much fun reliving this vacation. I’m happy to know others have enjoyed viewing my photos as much as I have enjoyed taking them and sharing the story behind them. Thank you. 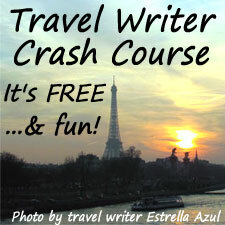 I’m so happy to share the pictures of such a beautiful place, and our experiences too! 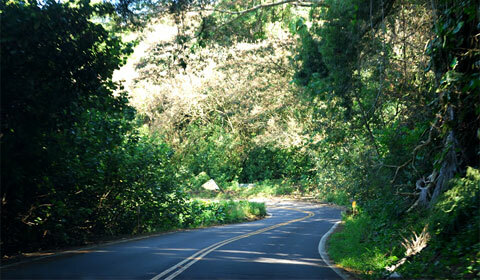 We love the road to Hana, we are on it everyday. You have some nice pictures. It sounds like you started out later in the day so you would have missed the early morning rush of traffic and commuters. 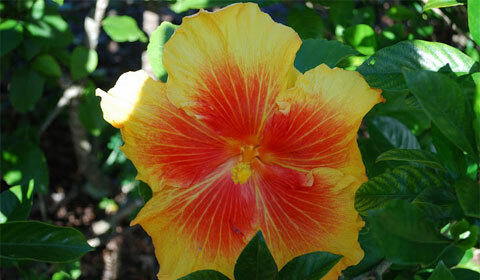 Hopefully you found many of Hana’s hidden treasures. Yes we left later in the morning. Later then we planned actually. We had a hard time finding the Safeway, before heading out. LOL. Hana is an amazing place. It truly is heavenly! I don’t know if we found all the hidden treasures Hana has to offer, but that just gives us an excuse to come back. Not that we need one. I’d be packing my bags to go back right now if I had the chance! All I could think about with those chickens running around everywhere is. We could just go for a morning walk and we could come home with the makings for breakfast. Pick up some mango’s, starfruit, and a few eggs on the way and your ready to make an omelet, with a fruit salad on the side! Who needs a food store!